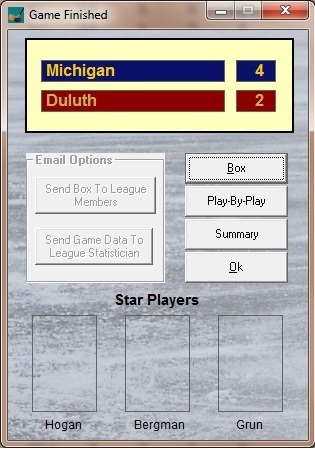 The most complete statistical hockey game ever. To return to your screen, click the back button on your browser. you'll love the statistical accuracy and strategy of Action! PC Hockey. Action! 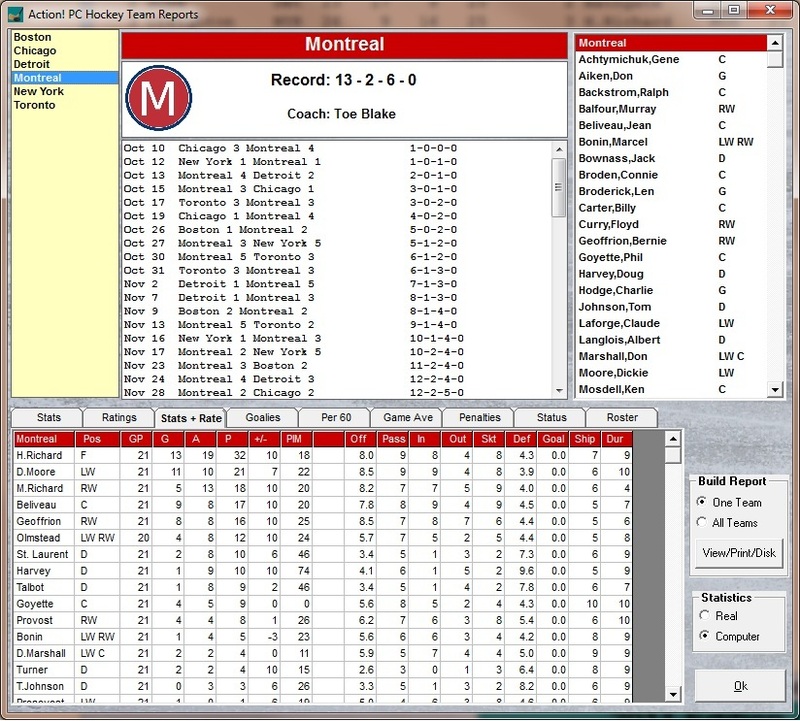 PC Hockey is the most comprehensive stat-based hockey game on the market. Order Action! PC Hockey 2018 Edition! Play Action! PC Hockey with our many available seasons. Choose from many past pro and Olympic seasons from 1954 to present! New game screen pop-up menu offers quick access to frequently used options. Right-click the ice to zoom forward, switch ice views, and more. Player icons more prominently feature team colors. New goal celebration option in the video chalkboard. Expanded variety of shot displays in the video chalkboard. Late game action is more explosive and realistic! New play call options for offensive zone faceoffs. Player usage SOG aggressiveness settings are more dynamic and easier to use. New crunch time playing time options help get key players on the ice at the end of a game. 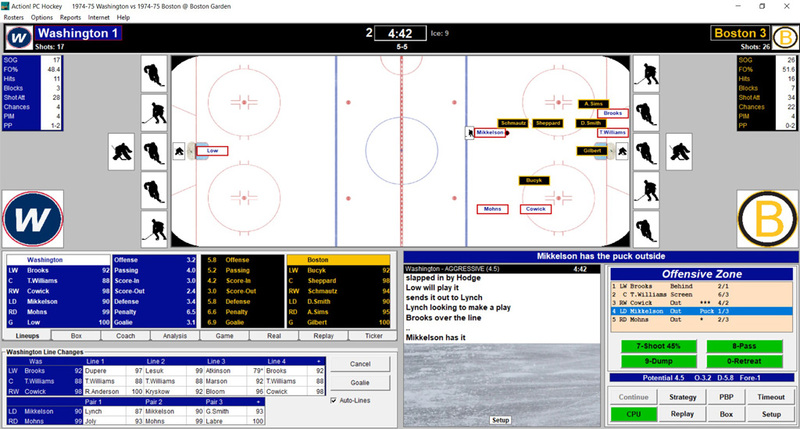 Expanded play-by-play includes more detailed and varied rush, faceoff, and shot descriptions. Fight build-ups, match-ups, and play-by-play are more realistic. Expanded fight results include post play fighting based more closely on the flow of the game, players engaging in multiple fights, match penalties, and so much more! Complete team win, loss, and stat history is included in the new encyclopedia and is easily accessible from the Team Roster screen. New easy-to-use tools for quickly adding seasons and building encyclopedias. Expanded transactions and roster tools located at Organize\Transaction. This expanded tool is an all-in-one tool for making roster additions, subtractions, trades, creations, and edits. Creating your own leagues, teams, and players has never been easier! Optional ROW listed in standings reports. Monthly standings and standings-by-date reports. 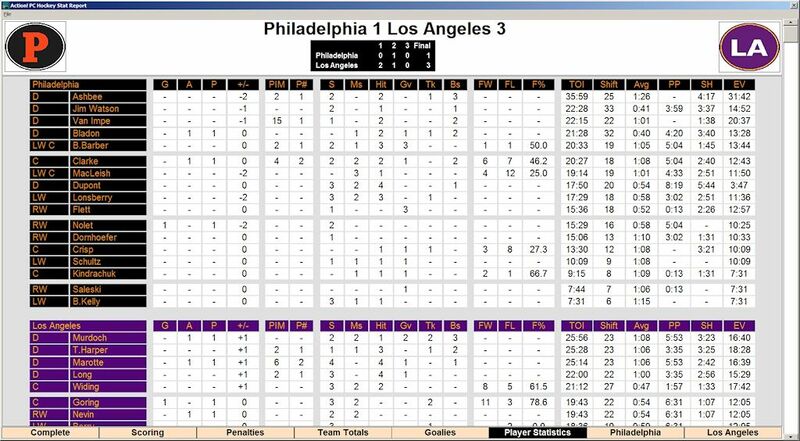 Option to view the box score immediately upon the completion of a game. New player stat editor that includes the ability to create player stats based on just a few attributes. Stats may then be edited as desired. New editing tool for increasing or decreasing all stats by a specific percentage for one player without the need to edit each stat individually. Opening screen drop-down lists for quickly changing between leagues. Expanded all-in-one setup tool includes all game preferences, and tools to install seasons or toggle between active seasons. New draft league rules allow you to set parameters for players eligible for the draft based on year and age. Player and year search functions have been added to the draft screen. Save $5.00 on the Deluxe or Deluxe-Classic package! For owners of any previous edition of Action! PC Hockey. Use the word UPGRADE as your discount code. This special upgrade offer is only available with an online purchase. If you are new to Dave Koch Sports or haven't tried our game in a while, this is the package for you! Included with every 2018 game package! Free Action! PC Hockey Strategy Guide in PDF form! 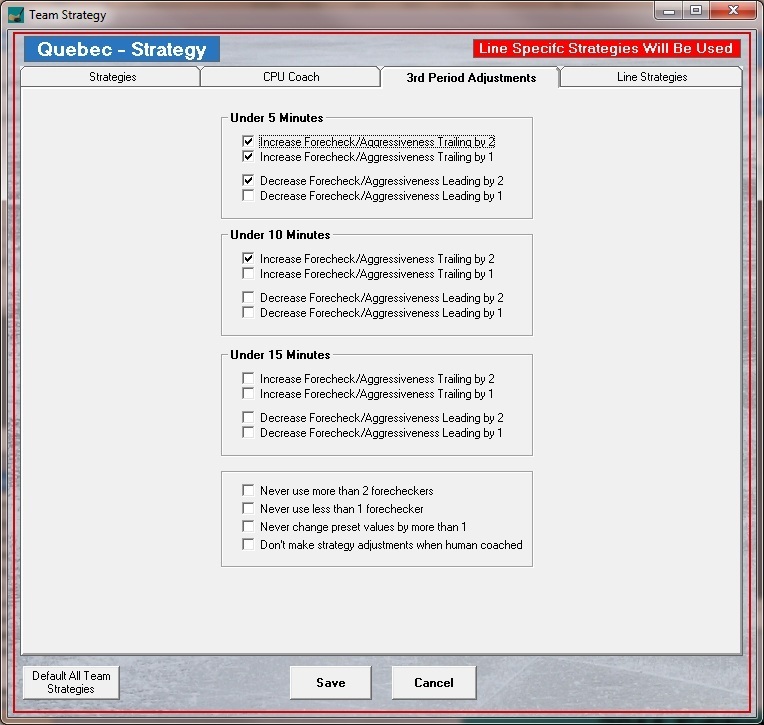 Line management is made simple by an easy-to-use line change interface. 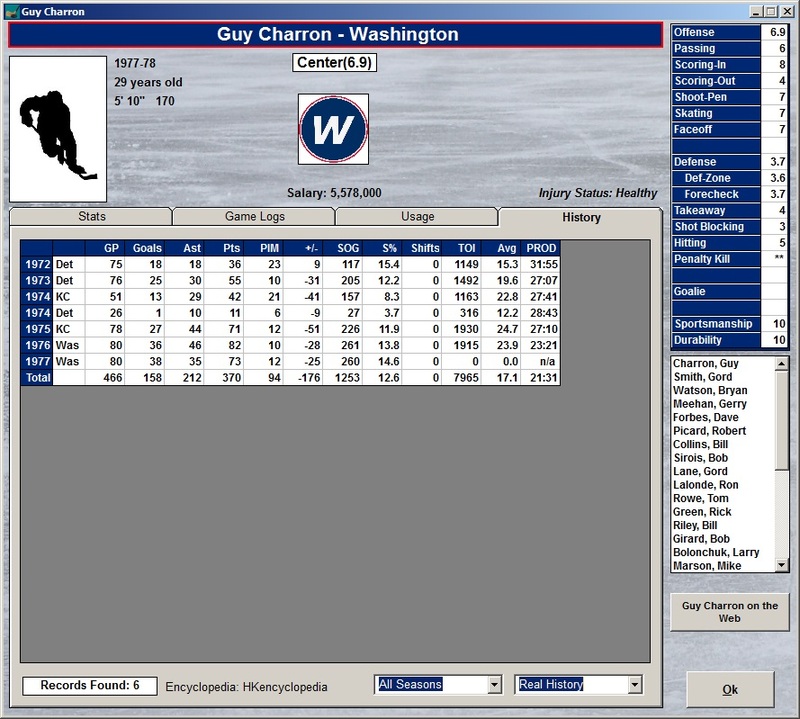 Put an entire line or individual players on the ice with a single click. Player strength on a zero to 100 scale makes it clear who is ready to play and who needs more rest. Lines are automatically adjusted when injuries and penalties occur. Double shifting star players is easy to accomplish. The simple yet powerful interface ensures that line management is never a hassle. 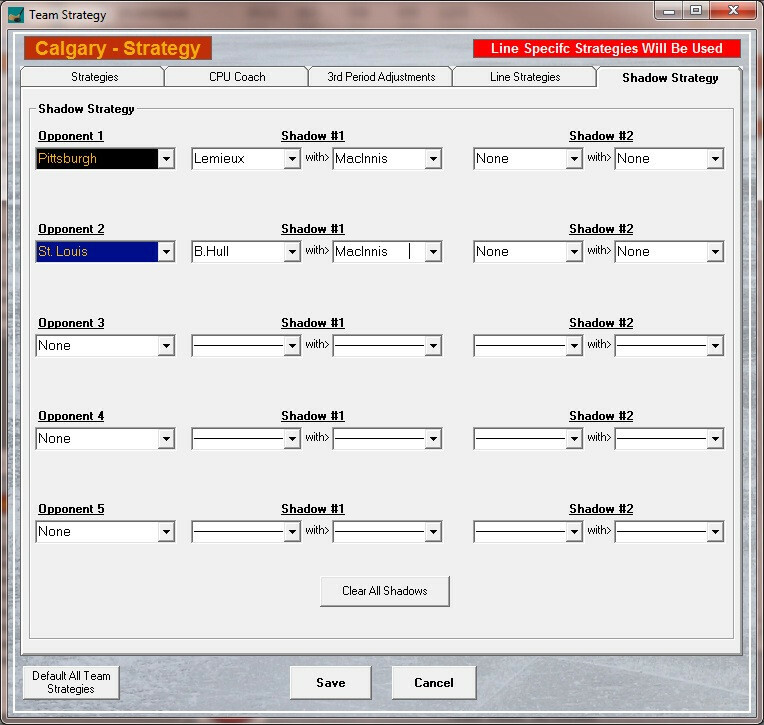 Action PC Hockey includes a wealth of strategy options. Strategies include forecheckers used, defensive zone aggressiveness and depth, offensive zone entry method, and offensive zone system. Strategies may be set for the team as a whole, as well as for specific line combinations and game situations. 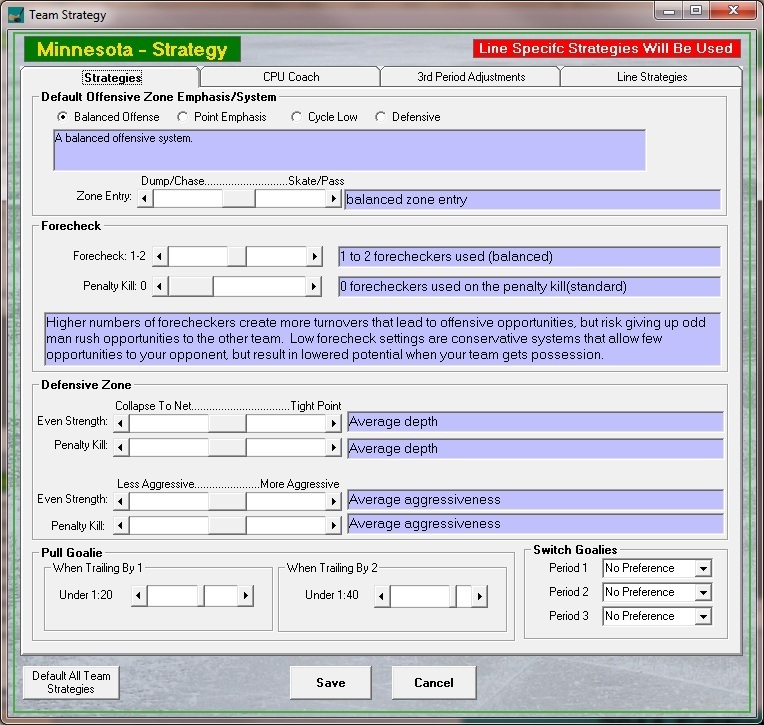 A programmable computer coach is also available for each team including line usage, offensive and defensive styles, late game strategy adjustments, and preferences for when to change or pull goalies. Individual players also have usage preferences that may be set including how often to pass or shoot from different ice locations, how often to attempt to deflect shots, join in odd man rushes, and attempt to penetrate past defenders. To help in understanding the influence each strategy has on the game, an in depth strategy guide is available free from this site. 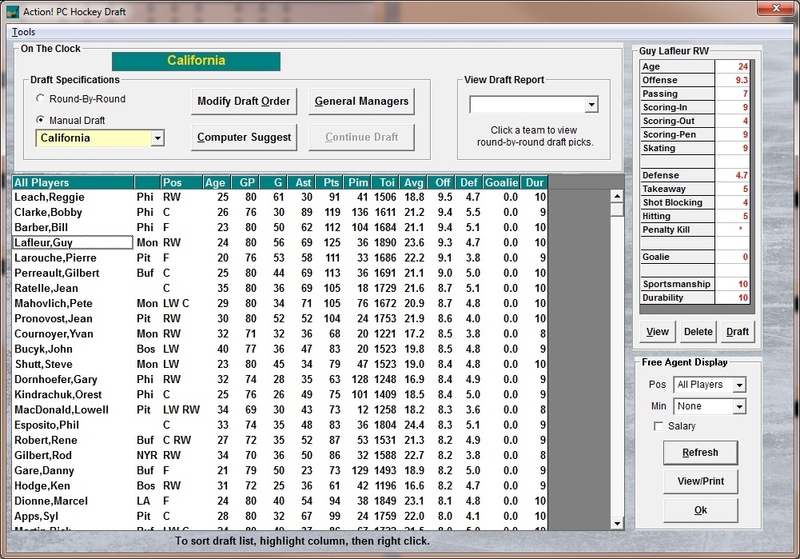 A complete set of general manager functions makes it easy to operate your league. Create, modify, draft and trade players and teams. 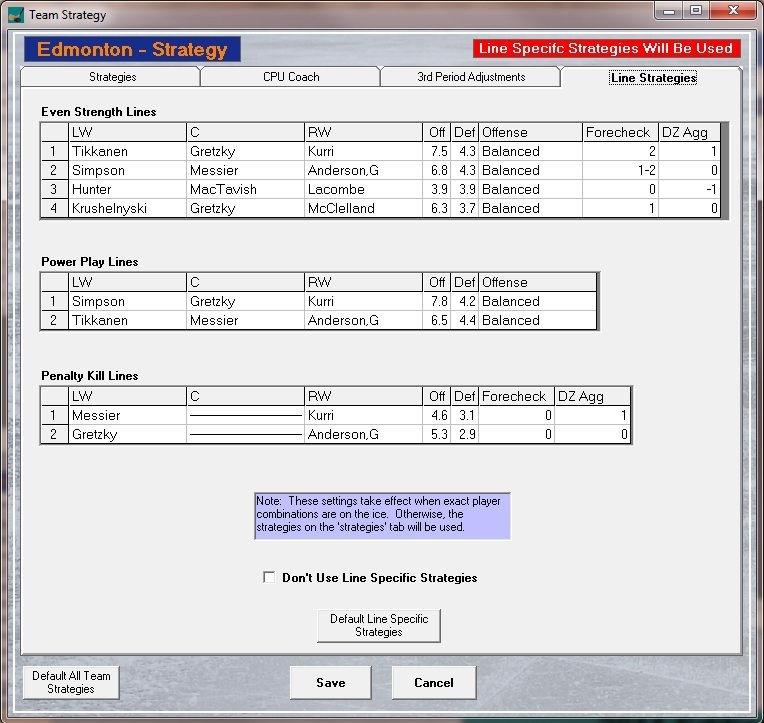 Design depth charts and set line combinations with all stats and ratings easily available. Save up to five complete sets of line combinations for each team. 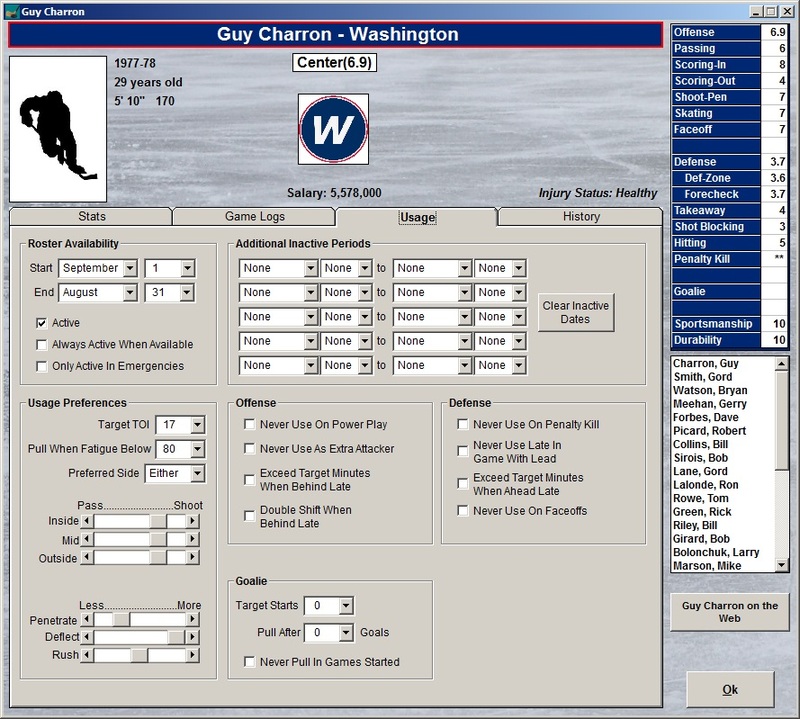 Create and assign ice graphics, team logos, and player photos. 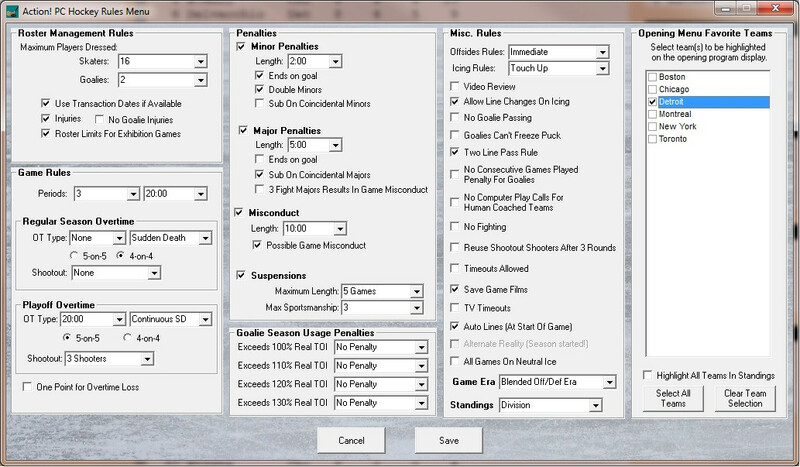 Customize league rules including roster limits, overtime and shootout rules, penalties, suspensions, player usage rules, icing and offsides rules, and many miscellaneous rules such as video review of goals and automatic TV timeouts. Action! 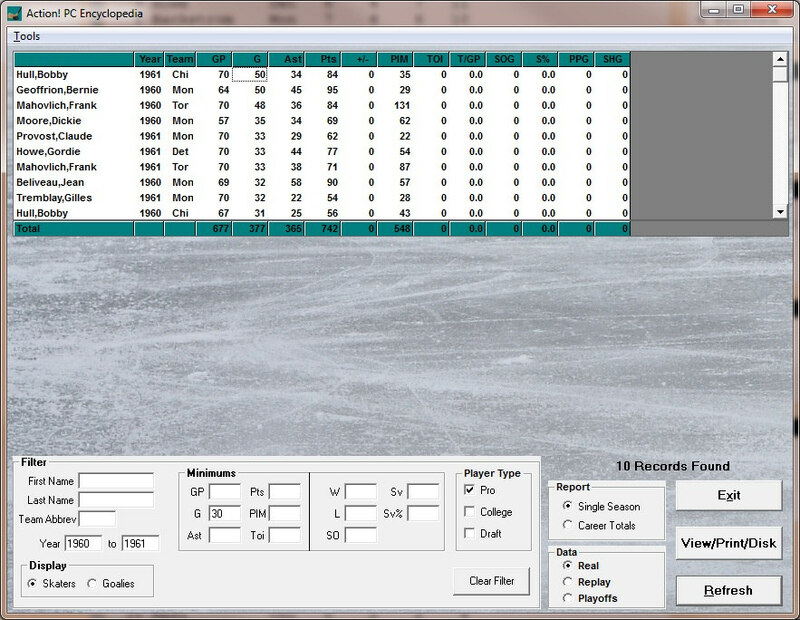 PC Hockey is loaded with player, team and league statistical reports. Customize database reports using hundreds of available statistics. All of the standard statistics such as goals, assists, penalty minutes, and plus/minus are included. The game also tracks hits, blocked shots, takeaways, giveaways, faceoffs, time on ice breakdowns, types of penalties, and much more. 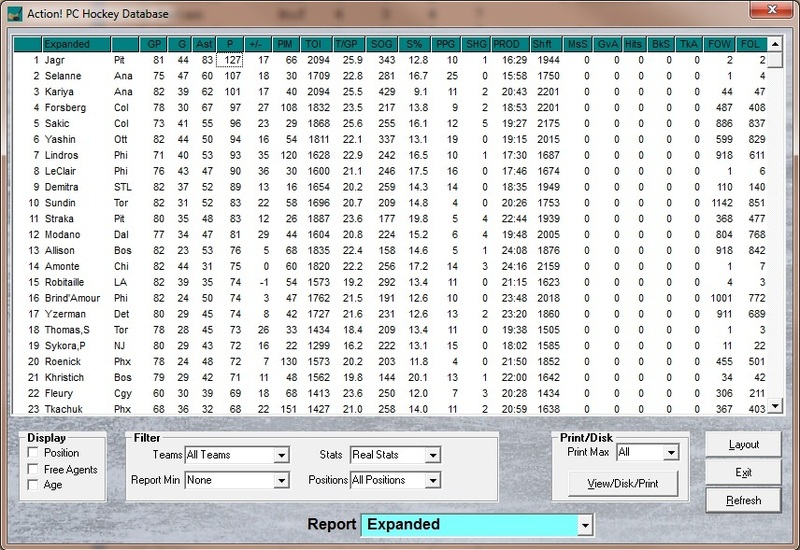 You can view raw statistics or stats based on game averages, home or road averages, high games and more. 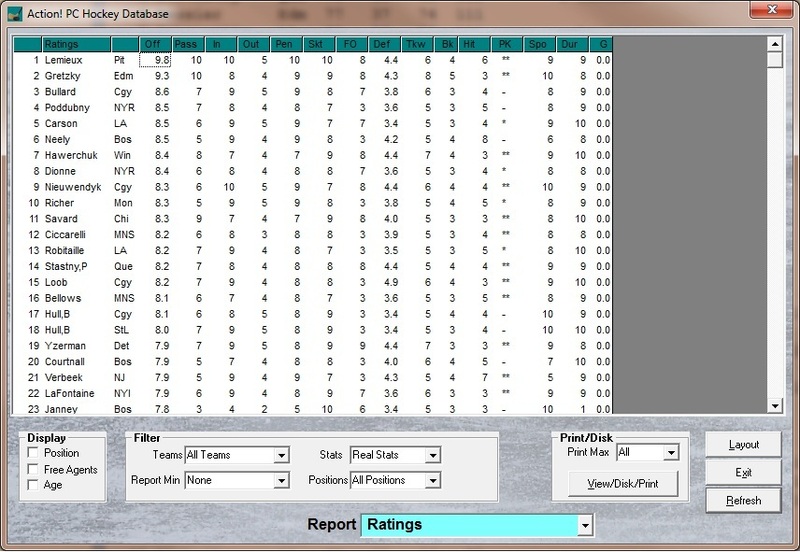 Player ratings are based on every available published statistic, as well as expert subjective analysis. 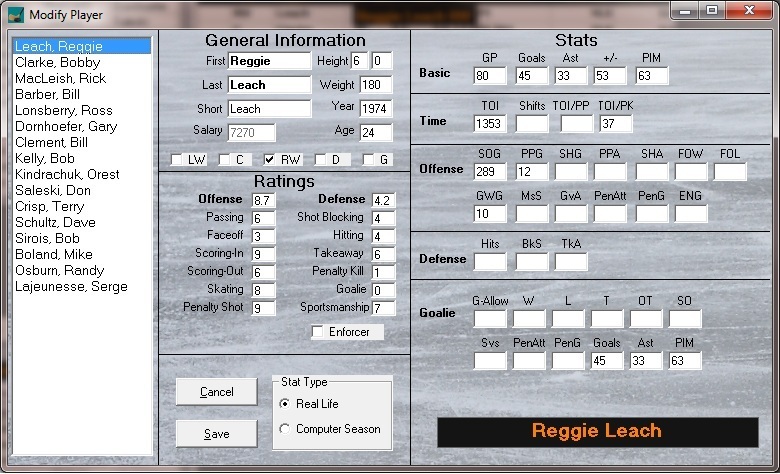 Player ratings include overall offensive ability, passing, inside and outside scoring, skating, penalty shot/breakaway ability, faceoffs, overall defensive ability, takeaways, shot blocking, hitting, penalty killing, enforcer status, goalie ability, sportsmanship, and durability. 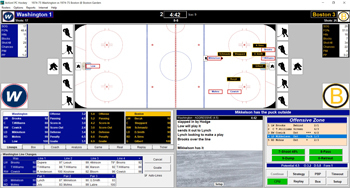 Extensive and exiting play-by-play makes playing a hockey game an immersive experience. Thousands of lines of text may also be edited by the user. Seasons include full real life schedules. Schedules may be modified or automatically generated. Player transactions are monitored by date, so you can replay a season using the actual trades and signings as they occurred in real life. Action! PC Hockey offers complete support for internet play. Hook-up and play one game or an entire series in one sitting. Zip and email league files with just a few mouse clicks. Email box scores to league members with one mouse click. Action! 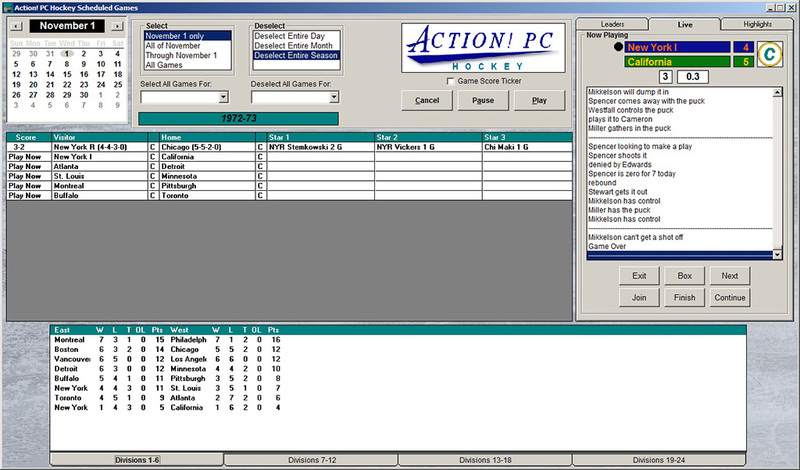 PC Hockey includes a useful set of utilities to run any face-to-face, email, or internet league. Export/import games, export/import coaches and many other features help make your league play simple and enjoyable. Many past seasons are available for purchase. These include pro, Olympic, and college seasons. The staff at Dave Koch Sports is continually adding to the lineup of available past seasons. 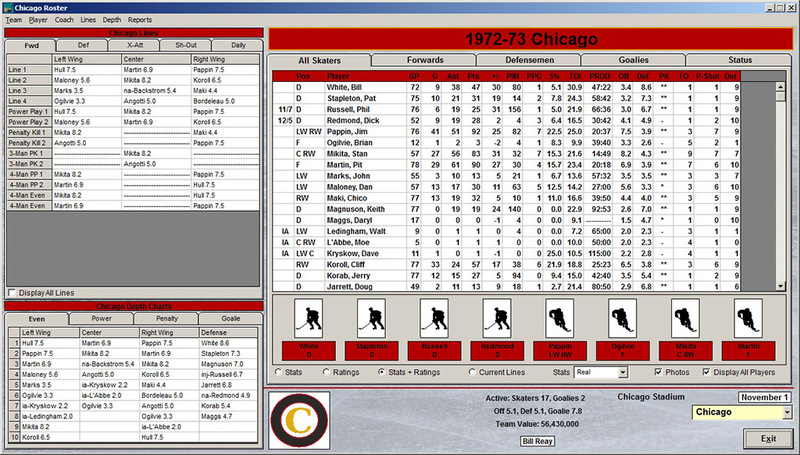 Action PC Hockey includes complete league data for every past season, allowing the game engine to make comparisons between players from different eras. This makes it possible to play a game between a team from the 1960s and a team from the 1990s, for example. Leagues can also be set to play in any era. For example, it is possible to put modern teams in the high scoring era of the 1980s.